What impact would a trade war between the U.S.
After years of high commodity prices, a new era of lower ones, especially for oil, seems likely to persist. This will be challenging for resource-rich countries, which must cope with the decline in income that accompanies the lower prices and the potential widening of internal and external imbalances. This column presents a new VOXEU eBook in which leading economists from academia and the public and private sector examine the shifting landscape in commodity markets and look at the exchange rate, monetary, and fiscal options policymakers have, as well as the role of finance, including sovereign wealth funds, and diversification. The sudden slide in prices in 2014 forced resource-rich developing countries into a rapid adjustment – less painful for those that had built buffers, more for those that had not. Whether the adjustment was more or less painful, resource-rich countries now face a second phase of adjustment: making structural changes to reduce resource dependence. The challenges over the medium run are enormous, especially considering how difficult it has been historically for these countries to diversify their economies (Venables 2016). What is more, new risks have emerged such as stranded assets—fossil fuel assets that will no longer earn an economic return because of declining demand caused mainly by global environmental concerns (McGlade and Ekins 2015). A new VoxEU eBook based on the proceedings of a conference held in Algiers, Algeria, in May 2016 aims to synthesise some key insights that have emerged from the latest economic research on resource-rich countries, making them user-friendly for both policymakers and scholars (Arezki et al. 2018). The common denominator of the research is that the countries must build and maintain a robust macroeconomic framework in the wake of the collapse in commodity prices. The scholars also cite the need to think differently about the role of finance and diversification in the transformation of these economies. Most studies have emphasised excess supply as the dominant factor in the 2014 oil price collapse. Although historically supply changes have been exogenous to the economy, in this case the increase in supply was caused by powerful shifts in technology triggered by high prices. These price-spawned technological innovations, led to the adoption of new recovery techniques, which in turn spawned the development of ‘unconventional oil’, such as that produced from shale. Provided they are effective and widely adopted, improvements in recovery techniques increase the size of recoverable oil reserves, which, in turn, changes expectations about future oil production – with potentially large and immediate implications for oil prices. But innovations in recovery techniques are not exogenous. Instead they are of the market, typically following periods of prolonged high prices or changes in regulations that render them more economical. Innovative drilling techniques such as 3D imaging and hydraulic fracturing – or fracking, in which water is injected to free up petroleum trapped in layers of rock – gave rise to the substantial increase in production of shale oil in the 2000s. Continue reading here. Also see my previous post on forecasting recessions. A new post by Michael W. Klein shares the concern about the possibility of an upcoming recession that “Forecasting the twists and turns of the economy is difficult. One set of indicators used to gauge where the economy is headed draws on information from financial markets since the yields paid by financial assets reflect the collective market view of the future state of the economy. 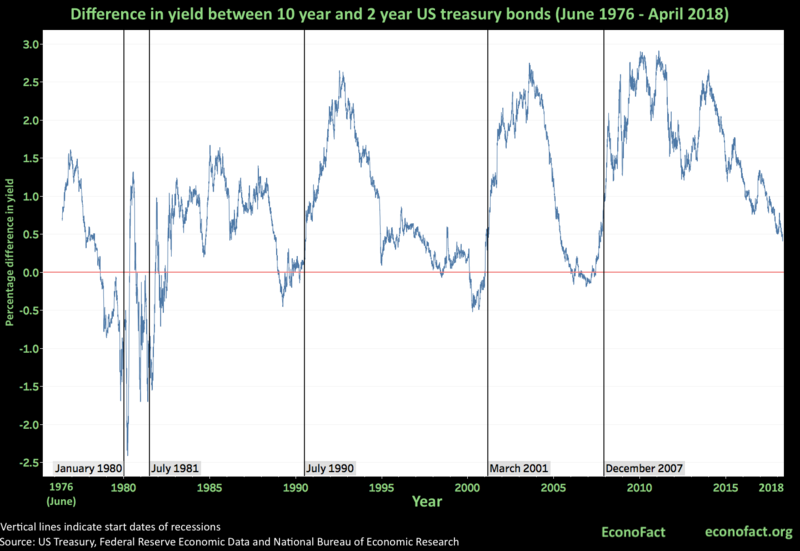 An inverted yield curve — when interest rates on short-term Treasury bonds exceed those on longer-term Treasury bonds — has in the past proven to be a strong indicator of an oncoming recession. “The average consolidation size (excluding zero observations i.e. considering that a fiscal policy action occurred) is 0.9 percent of GDP with a standard deviation of about 1 percentage point (Table 1).